Finally I was able to make it back to San Francisco, a feat that has taken me since the spring of 2007 to duplicate. And in this time, the city has exploded with numerous quality coffee prospects, some more on tongue tips than others. 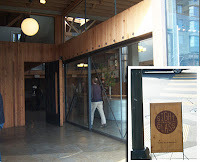 One that I had heard great volumes of was of Sightglass Coffee, a small, seasonal-focused coffee roaster run by the Morrison siblings. Wasting little time, I got my traveling companions out of bed promptly on our first day and made a bee line to meet a local friend at Sightglass' spacious coffeehouse. The building is slightly nondescript from the outside, but within the space blossoms into an open atrium of wood, with the coffee bar in the middle, lots of space upstairs (it was roped off when I came) and a nice seating area along the front window. Ordering, I chose an espresso of Owl's Howl (their e. blend) and a pourover of their Ethiopian (I don't recall whether it was the Yirgacheffe or the Guji Shakiso). The espresso, pulled short with a brown crema, held notes of smoked pork, bright tangerine, peanuts, fresh broccoli and a little cocoa, producing an all together scrumptious espresso. The pourover of the Ethiopian lent flavors of mango, some fig, black tea, olives, a tad of caramel and buttered rye bread within a light/medium body. The pourover proved splendid as well. I would now say that all of the hype was well-deserved, as Sightglass delivered superior coffee infusions and did it smoothly. The only area of improvement could be in terms of adding a little more warmth to the overall decor (twas a bit bland) but this was a critique brought up mostly by my companions. If you're hankering for a quality cup of coffee, set your sights on Sightglass Coffee. V Interested blog. thanks for sharing. thanks for good tips.